Data centres are highly reliant on dependable, accurate and easy-to-use power monitoring management systems. Ensuring constant monitoring of a reliable power network is fundamental in maintaining an effective power protection strategy for data centre operators. During the course of operation, risks to the power network are unavoidable and can cause major implications for data access and data loss. As data centre downtime is unacceptable for any operator, it is therefore essential that operators incorporate a robust power monitoring and protection solution into their overall data centre design and operation strategy. TVR Instruments supplies and supports a range of components from leading European suppliers, that can be used on either the AC or DC voltage supply in a data centre installation. Combining the ability to monitor the AC and DC voltage supplies of a power network within a data centre allows additional scope and opportunity to add reliability and enhance resilience. 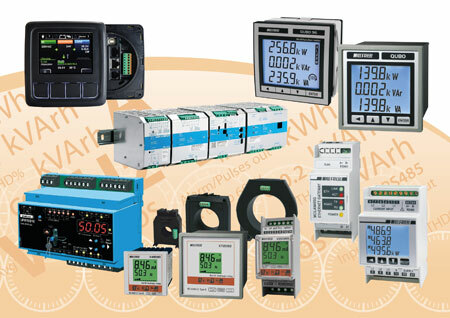 A comprehensive range of measuring and monitoring instrumentation is offered by Frer SRL of Milan, Italy. Many of Frer's products are capable of being fitted with serial communication and can be remotely monitored via the Frerlogger software package. The Frerlogger software package is client owned and hosted and enables 100% control of the system and the associated data capture. The software is installed on a server or PC within the client firewall to mitigate any possible IT security risk and any additional licensing or data storage costs. Its interaction with the facility management team is performed via the protocols defined in the IT security manual for the facility. The software is also designed to support all Frer serial-enabled devices but is extremely flexible and allows the addition of non-Frer devices such as DC UPS, battery chargers, and utility metering for water, gas or electricity. The system can allow for sub-metering and billing via an optional invoicing package. This enables a simple, efficient, MID meter supporting billing systems for tenants or facility users. One potential risk that is often not readily monitored can be earth leakage. An RCD or tripping relay can present an effective though reactive response to a deterioration in the stability of the earthing integrity of the installation. Frer offers Type A, Type B and Type F earth leakage relays that provide constant monitoring of the earth leakage current and are capable of feeding this information back via a communication network to indicate the progressive increase of an the earth fault risk. All the Frer digital earth leakage relays have a pre-alarm and optional support for MODbus RS485 RTU. The Type B relay includes the monitoring of DC signals on the AC network and provides protection against harmonics and high frequencies which can cause a fire risk. German manufacturer, Ziehl provides support for the AC voltage supply with a range of protection relays. Ziehl offer a comprehensive range of protection and measuring devices which meet the stringent requirements of many applications, such as transformer temperature monitoring, loss of mains supply protection, load and energy efficiency management, phase sequence and earth fault monitoring. Short-term DC power back-up is required to support crucial equipment until it can register a suitable error notification and safely close down or maintain essential loads until a technician can attend. Manufactured in Italy, the Adel Systems product range is based around the use of the latest chipsets to optimise the monitoring and stability of the DC network. The CBI DC UPS series offers the combined features of a microprocessor-based power supply and battery charger in one integrated unit. Adel Systems battery chargers and DC UPS products offer serial communications options, including MODbus or CANbus. This enables continuous monitoring of the DC network. Adel Systems battery chargers and DC UPS operate a constant monitoring of the battery bank, every 90 minutes when AC is present, running a load on the battery and a subsequent charger cycle to ensures that back-up batteries are in optimum operating condition. As part of the temperature management of any power system, enclosure temperature control is essential. TVR Instruments distributes the Alfa Electric range of fans, filters, air-conditioning units, thermostats, hydrostats and enclosure heaters. The fans are designed to move from 26m3up to 700m3of air per hour. Alfa Electric fans are available as panel or roof mounting. TVR Instruments aims to provide a high quality products and service to ensure that an application appropriate power monitoring, management or distribution solution is successfully delivered and installed. At this years' Data Centre World exhibition, TVR Instruments Ltd will be exhibiting and demonstrating a comprehensive range of power security, maintenance and monitoring products. All the manufacturers represented by TVR Instruments are European-based suppliers offering high quality products, service and flexibility in all aspects of a project life cycle.